Mohini has opened seven windows and has kept them in the form of a stack. She is surfing seven different bank websites in seven different search engines, viz-Google, MSN, Bing, Microsoft Edge, Yahoo, Alexa and Ask. The seven different banking websites are SBI, RBI, PNB, OBC Syndicate, IDBI and Federal Bank. The window which is on the front of the screen is the topmost tab. Search engine Ask and Alexa are running at the top and bottom windows. There are three windows between search engines MSN and Microsoft Edge. 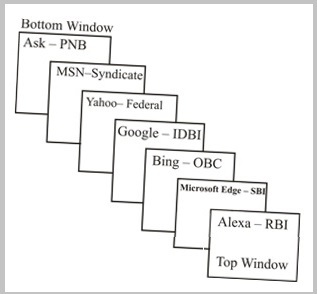 There are two windows between the windows in which Mohini is surfing Syndicate Bank websites and the window in which Bing search engine is running. OBC and Syndicate Bank websites are opened in windows which are below the window in which Alexa search engine is running but not at the bottom windows. In Google search engine, Mohini is surfing IDBI bank websites. The window in which Mohini is surfing Federal Bank websites is just above the window in which MSN search engine is running. There are two windows open between the windows in which SBI websites is opened and the window in which Yahoo is running. RBI banking website is opened at the topmost window. Federal Bank website is not opened in Bing search engine. Ques : 1 Which of the following banking website is surfed on Microsoft Edge? Ques : 2 Which of the following combinations is true? Ques : 3 Which of the following windows is opened above the Microsoft Edge? Ques : 4 How many windows is/are opened between Yahoo and Alexa? Ques : 5 Which of the following banking website(s) is/are surfaced between Ask and Google? Ques : 6 OBC website is surfed in which of the following windows? 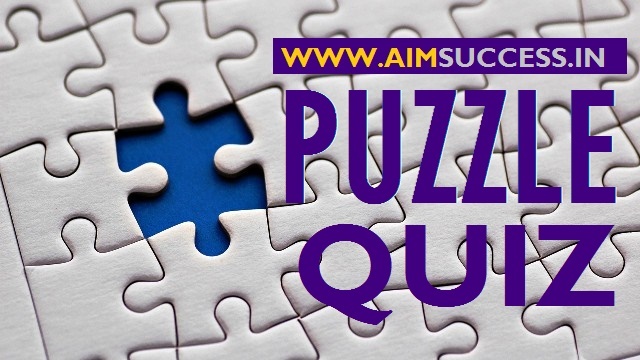 Ques : 7 Which of the following websites is opened just above the Syndicate bank?